After months of trials, Nielsen today is announcing an SDK that will give it the ability to measure how people view TV on mobile apps and other digital formats. Nielsen plans to use this data alongside its core business measuring traditional TV viewing, an essential component for how broadcasters ultimately sell ads against that content. By doing this, Nielsen is looking for a way to track consumers who now watch TV on “new screens” like tablets and smartphones — still a small number compared to overall TV viewing, but growing by the day, and therefore representing an increasingly interesting audience for businesses that buy TV advertising. Nielsen says the SDK, which will be available to Nielsen clients, will be out by mid-November. While Nielsen traditionally works with broadcasters and their partners to measure TV consumption, launching this SDK also opens up the company to working with other companies that are digital-only but are also playing a part in how people are consuming TV content today. They include Aero, Netflix, YouTube and more. Nielsen’s SDK has been on the cards for some time already. In June of this year, Nielsen completed a trial that measured CBS streams that played over the Syncbak app (CBS is a strategic investor in Syncbak). This also used Nielsen’s SDK. Then, at the beginning of October, reports emerged noting an announcement of Nielsen’s mobile streaming measurement service was imminent, but without many details of how it would work. To figure out who is watching those streams and where, Nielsen says it will use “big data and a census-style measurement approach.” This will involve matching information from services like Facebook — presumably based on your login credentials for those TV apps — and combining this with its existing National People Meter panel. It’s not clear if Nielsen is paying Facebook a fee to use its data or whether it will in exchange be providing Facebook with data in return that it can use to improve its own ad sales. (We’ve asked, and we’re also trying to find out who, besides Facebook, may be providing data.) Much like Nielsen’s social TV measurement partner Twitter, Facebook wants to make a big play for video and TV-related advertising, and it has been reportedly courting broadcasters with its own data about how TV gets discussed, liked and linked on its social network. The key with the new SDK is it gives Nielsen a way of measuring consumption that will augment its data on traditional TV viewing, but it will also be able to pick up data about other online video viewing that doesn’t fall into the traditional TV category. If a broadcaster makes a TV show available for viewing on a digital device “and it meets the ad load and timeline requirements for TV ratings,” Nielsen notes, then views of that content will get counted towards overall Nielsen TV ratings. On the other hand, content not eligible for TV ratings — “due to elapsed crediting time, dynamic ad insertion or because it originated from the Web itself” — then gets included in Nielsen Digital Ratings, i.e. 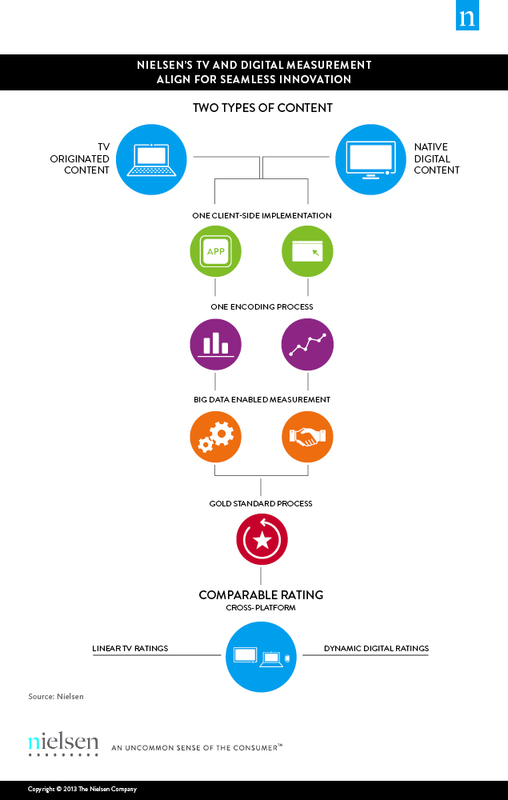 Nielsen Digital Program Ratings for content ratings and Nielsen Online Campaign Ratings for the ad rating. Traditional TV still accounts for the majority of ad spend — just under 58% of all ad spend worldwide in Q2 went to TV advertising, according to figures from Nielsen earlier this month. But as penetration of tablets and smartphones continues to grow, users are increasingly using those screens for their TV fix. Research from Ooyala notes that about 13% of all digital video plays now come from mobile devices like smartphones and tablets, growing by 41% in the first half of this year. In other words, while Nielsen’s traditional TV measurement business is probably still robust, a large part of that may have had to do with the fact that it can be measured better. Now that it’s introducing new ways of measuring apps and other online formats, it will be worth watching to see how and if ad spend shifts more as a result.